You can place this #CookieWeek cookie in the columns of easiest, quickest, cleanest, and most expensive. The entire thing is made lickety-split quick in a food processor. That's it... one container to clean. The process could not be easier and the clean up is minimal. 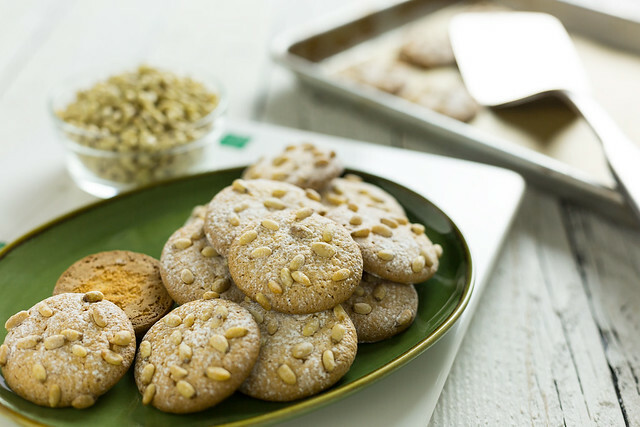 The paste and the pine nuts make this cookie a little more expensive than most other cookie recipes, but your investment will be rewarded with delightful, classic, international flavor. Pignoli is an Italian mainstay, particularly for the holidays. The texture is crispy on the outside with the crunch of pine nuts and slightly chewy on the inside. It is one memorable cookie experience. Some die hard pignoli fans may scoff at the inclusion of orange zest, but that is how I first had these and how I am passing it along to you. Now, I can’t imagine them without it. The pairing is perfect. The pine nuts will stick easily to the surface of the rounds, but you may need to press a few slightly that roll to the edge. Resist the temptation to take them out too early. They should be lightly golden brown. Removing them prematurely will result in a flat cookie. These will be stuck to the parchment paper. Very carefully peel them away after completely cooled. Preheat oven to 325˚F. Line baking sheets with parchment paper. Break almond paste into small pieces and place in a food processor. Pulse paste in long bursts until it is broken into fine pieces. Add salt, sugar, egg whites, and orange zest. Process until dough becomes smooth (about 2 minutes). Transfer the dough to a piping bag fitted with a 1/2” tip. Pipe the dough in 11/2” rounds on the baking sheet with at least 2” space between them. 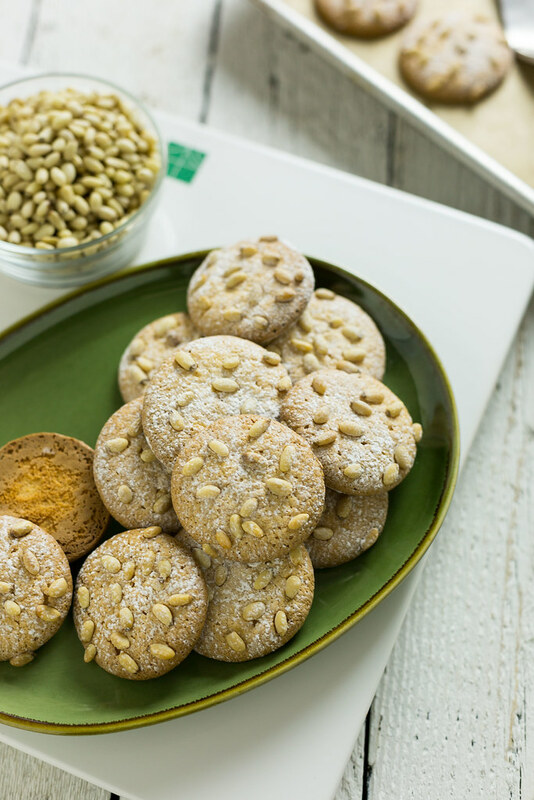 Sprinkle 12-15 pine nuts on the surface of each round, pressing them in slightly as needed. Bake for 15-18 minutes or until golden brown around the edges and bottom. Allow to cool completely on the tray before removing them. Very lightly dust cooled cookies with confectioners’ sugar.